Designed to meet the requirements of the most demanding sportsmen and women, the Longines Conquest VHP Collection brings together the brand’s core values of elegance, performance and tradition. Offering outstanding functionality and styling, this Longines VHP Conquest Men’s Watch proves that modern design can be perfectly timeless. 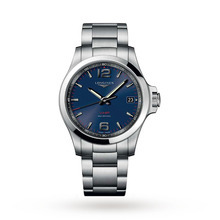 Featuring a scratch-resistant sapphire crystal glass, a polished stainless steel bracelet, a 41mm steel case and a striking blue dial, this timepiece also offers water resistance up to 50 metres and is powered by a Quartz movement.